Here’s the thing about procrastinating on…oh…pretty much everything. Or being stuck, or blocked or whatever. Something is bound to get accomplished at some point. I mean I’ve been avoiding writing this post for over a week. So why am I writing it right now? Because I sat down to plan the details of my daughter’s mermaid birthday party. So I’m doing this to avoid that. I guess my issues about THAT are bigger than my issues about THIS. Which is not to say I have issues about planning a birthday party, at least I didn’t think I did. But who knows. Maybe I do. Mermaids can be scary. They kind of seem like clowns with long hair and no legs, except they are under water and they sing and they don’t even juggle. Like I said — scary. 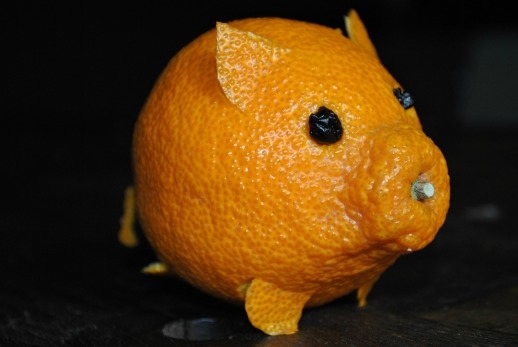 Some of you may wonder how I could have an issue about writing about a Sumo Tangerine. (And for those of you who take that completely in stride, may I just raise my glass to you with a hearty “cheers!”) It’s not like I haven’t written about tangerines many times before. My answer is that I don’t really know. Sometimes you get stuck. Sometimes, every single March for three years in a row, you get stuck. 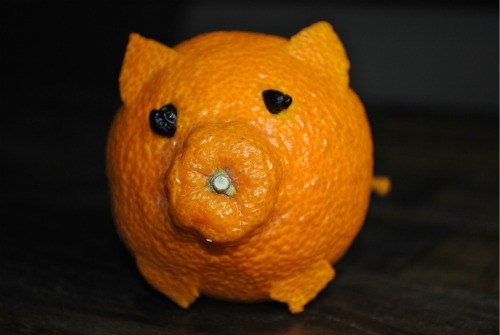 So instead of particularly writing about the Sumo Tangerine (you can read a great LA Times article about it here, which includes criminal activity, 10+ years of tracking and some good old-fashioned citrus drama), I give you this pig because that is what is in my heart. 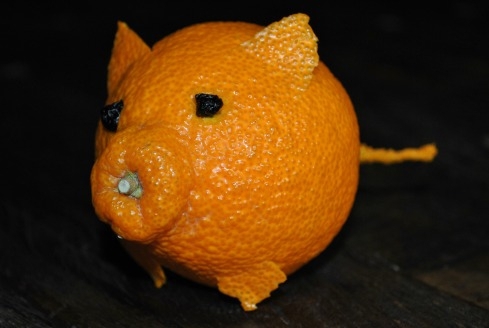 I like pigs and I like this tangerine. So there you have it. Cute. Y’know, if you just look at the photos w/out the exposition it appears as if the tangerine pig is doing that foot stomping dance the rikishi do as they begin a match. He just needs a mawashi around his little belly. Was that intentional? Good luck with the birthday. I say make it a swim party, watch the Disney movie, but don’t include a pinata. I witnessed the dismemberment of a mermaid pinata by preschoolers and found it distressing, no matter how creepy fish-girls are. to quote my favorite arachnid. Megan – Ha! I just looked rikishi and I see what you mean. It wasn’t intentional – but um..awesome!! Thanks for pointing that out. So fun! 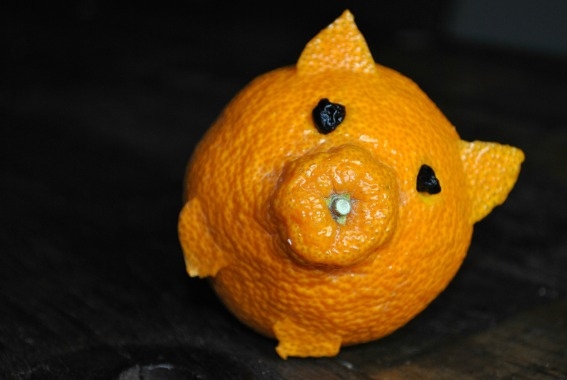 Adam – SOME PIG. I love love love it. Great quote.